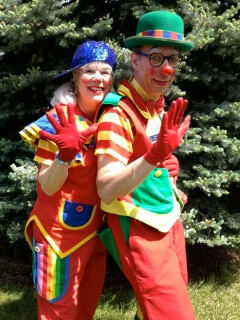 We are Juggles and Glitter, two professionally trained clowns that love bringing smiles and laughter to children of all ages. We specialize in family entertainment and perform at corporate and family events of all kinds. Please explore our website to learn more about us. We’d love to hear from you! I seen your story on “Twisted: A Balloonamentary; God Bless you both and your family. My daughter really enjoyed seeing you at the event at Riverside Square! Thanks, Michele! I’m so glad she had fun! Wishing you both miles of smiles! Thank you so much! It was such a great day! The monkey on the tree is one of our balloon favorites. Wishing you and your son miles of smiles!